From Amazon to Etsy and Microsoft, tech companies are demanding cheaper and cleaner electricity as their data demands grow. That runs counter to Trump-administration plans to keep coal plants afloat. Selling custom nose rings, crocheted bunnies and hand-carved Santas is energy-intensive stuff. Just ask Etsy, the go-to marketplace for crafts that doubled its electricity use in two years to feed power-sucking data centers that keep the $2.8-billion-a-year business running. It’s one of the many technology giants including Amazon.com and Google demanding cheaper — and cleaner — electricity as their data needs grow. This hunger for power has set Silicon Valley on a collision course with President Donald Trump’s administration, which is working up a plan to keep coal plants afloat by raising electricity prices. As a rare source of growing demand, these tech firms have become formidable advocates for clean energy. They’ve contracted enough renewable energy to displace at least 12 coal generators, and some are paying millions to sever ties with utilities to find their own supply. Big Tech is no longer “afraid to throw around their weight or their ability to influence — some might say bully — their local utility or local governments in what they want to get,” said Lucas Beran, a senior research analyst on IHS Markit’s data center and cloud team. It’s easy to see why the companies have become such advocates. Power used by all the nation’s data centers is set to climb 4 percent from 2014 to 2020, according to an Energy Department report. Server farms now draw enough electricity to light up Las Vegas and the rest of Nevada, twice over. Etsy alone used 10,679 megawatt-hours last year — enough to supply 1,000 homes. While coal still accounts for about a third of U.S. electricity, it’s losing ground to cheaper natural gas, wind and solar. Hundreds of mines have shut in recent years, and President Trump campaigned on a pledge to revive them. His administration is now calling on the Federal Energy Regulatory Commission to enact a plan that would subsidize coal-fired power plants. The fight to transform power supplies is just the latest instance of technology companies flexing their political muscle and green image. Earlier this year, the industry opposed Trump’s decision to remove the U.S. from the international Paris climate accord. Many, including Google, Microsoft and Facebook, pledged to continue the battle against global warming. Meanwhile, building solar and wind farms is now less expensive than keeping coal generators online in parts of the U.S., and solar power is set to become the world’s cheapest source of electricity. Renewables account for about 15 percent of the U.S. power mix, compared with almost nothing two decades ago. Utilities aren’t opposed to investing in renewable power. But technology companies are demanding supplies in quantities that could disrupt the reliability of transmission systems, said Matt Mooren, an energy adviser with PA Consulting Group. Electricity is notoriously hard to store, so for the most part, it must be used instantaneously. Solar and wind farms don’t work when the sun isn’t shining and wind isn’t blowing. That creates a juggling act for utilities that must maintain a steady flow of power to customers. Industry consultant Lazard estimates a grid can handle about 30 percent of its power coming from renewables. Beyond that, utilities need backup systems like batteries or conventional power plants. Even so, the technology industry won’t let up on its demands, said Mark Mills, a senior fellow at the free-market think tank Manhattan Institute who authored the 2013 study “The Cloud Begins With Coal.” Improvements in the efficiency of servers have slowed just as demand for data has taken off, he said. Information stored in data centers globally will quintuple by 2020, according to Cisco Systems. Switch, a Las Vegas data-center provider, agreed to pay $27 million last year to leave its Nevada utility in a bet that the company could find cheaper renewable energy elsewhere. Microsoft paid almost $24 million to bypass a Washington utility and find power on its own. In September, a group of tech firms including Adobe Systems pressed Dominion Energy for more renewables in Virginia — a hot spot for data centers — noting that the companies represent the utility’s biggest source of future demand growth. Less than a month later, Dominion agreed to add clean power for a new Facebook data center, paving a potential path for others. The pressure on utilities to source more renewables is only going to increase as large companies strike deals like this, said John Powers, who works for a Schneider Electric unit providing clean energy products to businesses. The company pointed to one group as proof: The Employers for Renewable Energy describes itself as a coalition advocating for companies to move to states that don’t “stifle” their desire for clean energy. Tech companies have a lot of leverage now over state governments and utilities that are “drooling” over the power use from data centers as demand from other industries flatlines, said Gary Cook, a senior analyst at Greenpeace who specializes in information technology. And the companies aren’t waiting on government to effect change. In West Virginia — the heart of America’s Coal Country — potter Joy Bridy makes everything from mugs to sauerkraut crocks that she sells on Etsy. Her operation is powered by solar panels that Etsy helped her get. Despite her state’s deep roots in coal, she backs the company’s fight for more renewable energy. Google, the biggest corporate buyer of renewable energy, is buying even more — 536 megawatts of wind power from four different power plants. The Alphabet unit agreed to buy 196 megawatts of wind power from two Avangrid power plants under development in South Dakota, and 200 megawatts of wind power from an EDF Renewable Energy project in Iowa, according to company statements Thursday. It also agreed to buy 140 megawatts of wind power from an Oklahoma wind project built by Enel. Terms of the deals weren’t disclosed. Google has now signed enough renewables deals to match all of its energy needs this year, though not all the projects are currently operational. The company has agreed to buy 2,397 megawatts of clean power in the U.S. — and 3,186 megawatts overall, according to Bloomberg New Energy Finance. 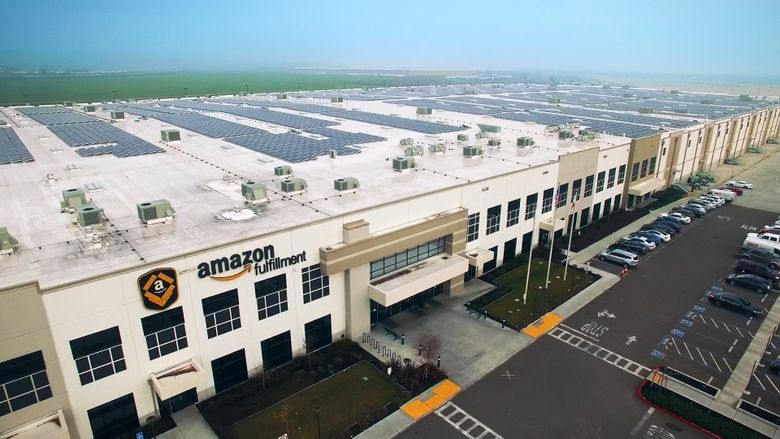 Amazon is the second-biggest corporate buyer, with 1,219 megawatts, all in the U.S.